This May 24-25 FULL MOON (9:25pm PDT, 12:25am EDT, 4:25am GMD) is a follow-up eclipse to the ring-of-fire Solar Eclipse on May 9, a powerful doorway. This Lunar Eclipse is a more subtle, penumbral eclipse that only imperceptibly dims the Full Moon in Sagittarius. Still, an eclipse is an eclipse. See the Full Moon wink at you, an invitation to the dance, a moveable feast led by the Gemini Trickster. “Variety is the spice of life” is a motto of this air sign that gets bored easily and lives life spontaneously, more in-the-moment than most others. With Sun, Mercury, Venus, Jupiter all in Gemini, the dance party is in full swing! The elusive shadow of this Full Moon eclipse is beautifully echoed by its square with Neptune, the Dreamtime Planet, in its home sign, Pisces. As mentioned in previous Cosmic News articles, Neptune entered Pisces in 2012 to begin a 14-year cycle, adding a subtle tone to the collective consciousness. At best, Neptune’s mysticism is a communion with the angels. On the other end of the spectrum, it opens a downward spiral into illusion and delusion. A highly sensitive sign, Neptune is like a sponge that soaks up all sorts of vibrations. Vigilance is needed to keep tuned up and tuned in to the finest frequencies. This Full Moon in Sagittarius can point us to our highest aspirations or blow-up into paranoid fantasies. It brings experiences that severely challenge and dissolve imbedded belief systems. This is a step-up in the frequency level! The Full Moon is, of course, reflecting the light of the Sun in Gemini. Looking at the formation in Gemini, we find a very intriguing stellium at 19 degrees, repeating the number of the Taurus eclipse. Gemini loves doubles, triples and quadruples. It revels in duality and the shadow play of dark and light. Here we see Mercury, Venus and Black Moon Lilith occupying the same degree, with Jupiter near by— a really stunning combination of cosmic factors added to the spiritual potency of an eclipse with such a strong Neptune influence. 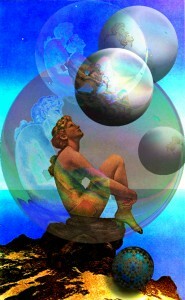 MERCURY rules Gemini=open-minded curiosity, perceives multiplicity of potentials on a cognitive level. VENUS is the esoteric ruler of Gemini because it creates a harmonic higher mind/ lower mind interface, head and heart, thereby attracting emotionally resonant ideas. JUPITER can rise to the occasion as the Wisdom Planet. In Gemini gets a bit distracted by all the possibilities. At best, especially with the help of the Sagittarius Moon, dualistic beliefs are superseded in expanded inquiry into these possibilities and the situation at hand. BLACK MOON LILITH adds a whole other level. Not a body, it is mathematical pivot point intimately positioned as the second center of the Moon’s elliptical orbit around the Earth. Used more in Europe than the U.S Black Moon channels a deep desire of the soul for pure, authentic experience or ultimate reality. It is clearly worthy of further study as a vehicle for awakening consciousness. What does that mean? That’s just it. There are no definitive answers. However, the ever-useful Gemini-style Wikipedia cites a variety of resources, referring to “wisdom gone wild,” a mystical madness, the hopelessness of any answers, casting off any concerns or conventional standards—whatever it takes to blow our minds. When things don’t make sense, our minds are shocked out of normal dualistic concepts of what we define as reality or who we think we are. There are no answers, only questions that lead deeper through Alice’s looking glass to see that the outer and inner worlds are one, that the phenomenal world and transcendental Reality share the same essential ground of being—brilliant, shimmering Intelligence. Lilith invites us into the essence of Being, where “nothing needs to be done, there’s just a ‘thereness’ there that makes things possible,” writes spiritual psychologist A.H. Almaas in his book, Brilliancy. It is a matter of touching into the solid ground of who we are, which gives an inherent sense of support. We don’t need to do anything. Ah, can we hang out there long enough to allow the energy to shift into a new pattern? This is what eclipses are for. This is a moveable feast in changeable Gemini, which can invite crazy wisdom or be just plain crazy-making. Things may feel at odds for the following few days, as such subtle eclipse effects skew our nervous systems, especially on the 26th-28th. Before it leaves the full feeling of Sagittarius, the Moon opposes the tightening conjunction of Venus, Mercury and Jupiter. Tune in to your deep place that knows. On May 28 MERCURY moves into CANCER and MARS into GEMINI. The quality of Mercury’s thinking becomes more subjective, feeling our way rather than rationalizing even as Mars spreads into the widening field of dreams. KEEP ON DANCING & SPINNING! IT’S A WHIRLING DERVISH FULL MOON. GEMINI ASTRO-SPECIAL—I am inaugurating a monthly Sun sign special for birthday people. This is Gemini time to enjoy an hour consultation, taking the cosmic temperature of the eclipse energy and your upcoming year. $120. ALSO—Half-hour “quickie” tune-ins for $75. Previous clients only.